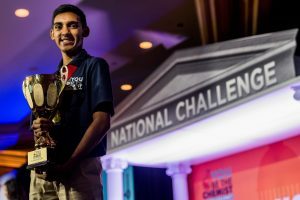 ARLINGTON, VA – Seventh-grader Shreyas Arcot from Glen Allen, Va., today won the title of National You Be The Chemist ChallengeChampion by correctly answering science and chemistry-related questions throughout an exhilarating day-long 11 rounds of academic bee-style competition. It was his third time competing at the National Challenge. This year the top four placing students won academic scholarships totaling $22,500 and other science-related prizes.Read full Media Release here. CEF Executive Director presents the 2018 award to Dr. Larry Sernyk. ARLINGTON, Va. – The Chemical Educational Foundation (CEF) today announced its first-ever Community Champion of the Year, former Dow AgroSciences Canola Breeder and Project Manager, Dr. Larry Sernyk. Dr. Sernyk is one of 14 Community Champions recognized this year for their contributions to volunteerism and STEM (science, technology, engineering, and math) education in communities across the nation. Since connecting with You Be The Chemistin 2010, Sernyk has led almost 40 hands-on workshops as an instructor certified through CEF, in addition to organizing and expanding the You Be The Chemist Challenge in Indiana. Read full Media Release here. 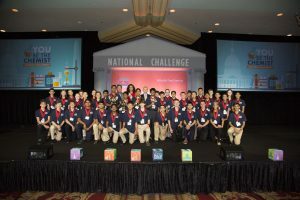 ARLINGTON, Va. – The Chemical Educational Foundation (CEF) has announced the 42 middle school students who will be competing on June 18 in the 2018 National You Be The Chemist Challenge in Washington, D.C. For its 14th year, CEF, a non-profit organization dedicated to inspiring students to pursue chemistry and STEM-related learning and careers, facilitated local and state You Be the Chemist Challenges for approximately 46,000 students ranging from grades 5-8. 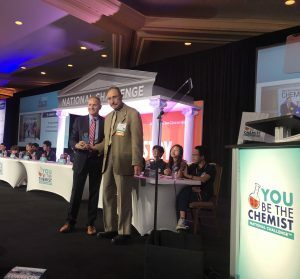 Local, state, and national You Be The Chemist Challenges are designed to engage middle school students in chemistry in an effort to demonstrate the importance of science in their everyday lives. In a bee-style competition, students in grades 5-8 are challenged to answer questions relating to chemistry and STEM (science, technology, engineering, and mathematics) subjects. Read the Media Alert here.